While he was lucky enough to enjoy artistic success when he was alive, Pierre-Auguste Renoir(1841-1919), a French painter who was one of the prominent impressionists during the late 19th century, unfortunately got a serious health problem during his later years, but he did not give up his career at all even though it was very difficult for him to use his hands due to his rheumatoid arthritis. In one episode I read during my elementary school years, his doctor recommended that he should focus on trying to walk for himself, but, after finding that he used too much of the remaining strength in his weakening body just for walking a few steps, Renoir decided that he would focus on painting rather than walking, and he kept moving on even when he needed someone to put a brush in his hand. “Renoir”, which was chosen as France’s official submission to Best Foreign Language Film category of the 86th Academy Awards in last year mainly because “Blue is the Warmest Color”(2013) turned out to be ineligible for submission due to a trivial reason, is a sumptuous period drama revolving around one brief period during Renoir’s last years. It is 1915, so the shadow of World War I is glimpsed from time to time, but it is mostly warm, sunny, and peaceful in the Côte d’Azur region of South France. 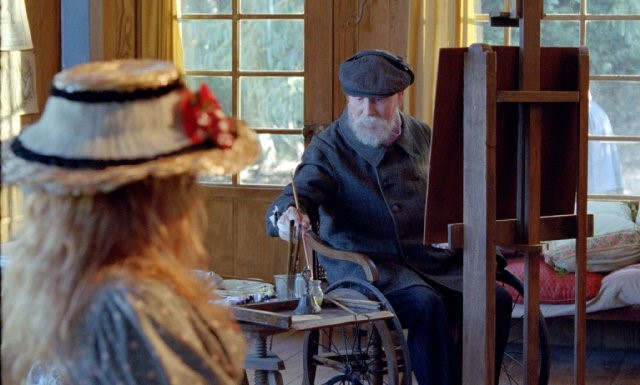 Focused on his painting as usual in such a comfortable environment, Renoir(Michel Bouquet) cares little about what is going on outside his small world, though he is concerned about his two sons who were injured on battlefield. He needs a new model for his paintings, and a young beautiful woman named Andrée Heuschling(Christa Theret) comes to his residence. She says that she is sent by his wife, and Renoir is rather amused because his wife died recently. Regardless of whether it is true or not(in real-life, Heuschling was actually sent by Renoir’s painter friend Henri Matisse), she has soft feminine skin he loves and admires anyway, so he gladly hires her as his model. Not many things happen while Andrée poses in front of Renoir for his paintings, but the movie slowly immerses itself into the leisurely atmosphere surrounding the characters. We get to know a bit about the women in Renoir’s residence who are always ready for taking care of their ailing old man, and we also meet Renoir’s youngest son Claude ‘Coco’ Renoir(Thomas Doret, who was memorable in the Dardenne brothers’ film “The Kid with a Bike”(2011)), a sullen boy who responses to Heuschling not so kindly during their first encounter but gradually shows some interest to her body like any teenager boy in his age would. And then Renoir’s second son Jean Renoir(Vincent Rottiers) returns to see his father. While having been recovering from a serious battle injury in his leg, he still wonders about what he will do next when the war ends. We witness his growing interest in movies, and many of you certainly know that he would be one of the great filmmakers in the movie history through his masterful works such as “The Grand Illusion”(1937) and “The Rules of the Game”(1939). With Andrée placed between two different artists in contrasting positions, the plot gets a little more thickened. 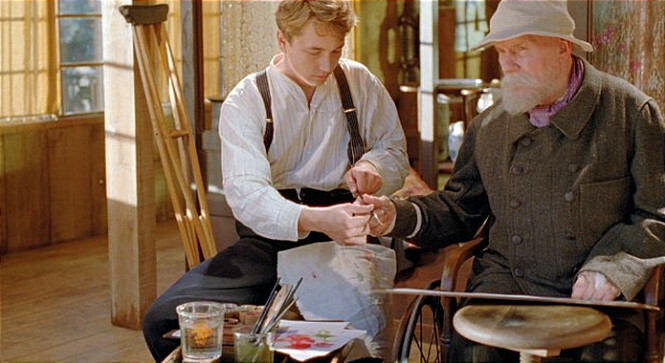 While Andrée finds herself as a consoling presence to the dying painter who becomes more painfully aware of his failing health day by day, she also functions as a sort of enabler to his son. As they spend more time together, Andrée and Jean entertain the idea of making a movie together, and she is willing to be the lead actress for his first movie although, as she frankly admits at one point, she is not exactly a very good actress. But the war is still going on while they leisurely spend their time, and the future remains uncertain for them and others. The anxiety and uncertainty during that troubled period is always hanging around the corner of the screen even when it looks bright and warm on the surface, and there is a haunting sequence in which Andrée comes across a bunch of injured soldiers on the road when she is going to the Renoir residence as usual. The war itself may feel like the news from the distant to her and others, but, as reflected in this sequence, it is still the reality they cannot ignore none the less. While never losing the sight of that grim historical fact in their daily life, the director/co-screenplay writer Gilles Bourdos fills his film with many gorgeous things to be appreciated. His cinematographer Mark Lee Ping Bin shot the scenes with vibrant lights and saturated colors reminiscent of Renoir’s paintings, and the locations in the film looks as lovely as some of his notable artworks appearing in the movie(of course, they are not the real ones but the imitations specially prepared for the production). Although I sometimes felt like I needed more background knowledge for watching it, “Renoir” is a well-made film equipped with handsome setting and lovely atmosphere, and I also enjoyed the performances in the movie. Michel Bouquet is especially good when Renoir’s fragility is crossed with the artistic spirit still remaining intact inside his wheelchair-bound body, and Christa Theret and Vincent Rottiers also give competent performances although the epilogue subtitle reminds us that their characters would become far more interesting to observe later. This is one of those ‘slow movies’ which require some patience to be appreciated, and you will probably enjoy it like I did if you are ready for its slow but rewarding visual experience. This entry was posted in Movies and tagged Model, Movie Director, Muse, Painter, Real-life figure, Real-life story. Bookmark the permalink.